Do you want to learn how to use chopsticks? Great, I’ll show you in this article. Upon knowing how to use our dining utensils, you can savor Vietnamese cuisines, understand further about our culture, and enjoy your trip to Vietnam. Frankly, at the time of writing this article, I have used the chopsticks over 30 years. Yet, I still feel a little puzzled when trying to explain the skill. Just like ordinary Westerners may not easily teach me how to use eating utensils like knife, fork, and spoon in the right way. So, I got to get a pair of chopsticks in my house’s cupboard, and closely watch how I hold and use the two piece of bamboo (that may be wooden in other Asian countries). Repeating the activity several times to figure out and remember steps in my mind, I can tell you how to use chopsticks now. Note that this technique is my Vietnamese style (or possibly a little of my own). People in other Asian countries like Japan, Korea, or China may hold chopsticks in a little different posture. If you want to practice, please buy a pair of chopsticks, possibly on Amazon. Or at least you should prepare two sticks of bamboo or wood for practice. Pick up a pair of chopstick, the smaller end is down, and the other end is up. You may use both hand to arrange a comfortable position, but finally use the hand that you feel easy, i.e. use your right hand to hold the chopsticks if you are right-handed, and vice verse. (3) the index finger puts slightly on same chopstick with the middle, and stiffen it for firm grip (just like scissors) to hold food. Chopsticks has different lengths (see above photo), the common position of your hand is roughly one third from the upper end. The initial angle to hold chopsticks is about 120 degree. The angle will be changed naturally more or less when you use during the meal. It’s just similar to a crane lifting goods. Practice opening and closing chopsticks, then holding foods. Make sure two chopsticks will make an A-shape (up or down depending on position), not an “X”. The later will get you hard to pick up and hold foods. In actual meal, pick up foods in comfortable position, slightly lift it up. Don’t get hectic. If you feel uncomfortable, put the food down and grab it again. If you drop food or even chopsticks on the table, don’t be upset or get it personally. I think that’s just a little cute small accident. I myself fall into the same awkward situation when I don’t know which hand to hold fork or knife to eat steak and may cause food splashing all around table. We all make this type of mistake, don’t we? And finally, once you know how to use chopsticks, just enjoy Vietnamese foods, and if possible, share your experience with your beloved and friends. When you’re comfortable with holding chopsticks properly, there’s something I want you to know about using chopsticks; something to keep your decent behavior in Vietnam. Don’t use a pair that two of chopsticks is not the same in length, or not straight. This may look a little ridicules and cause user inconvenient in using. Don’t grab food by chopsticks from holding dish or bowl and directly put into your mouth. That is considered impolite action. Don’t pass food directly from one’s chopsticks to someone else’s. Vietnamese believe that will brink bad luck. 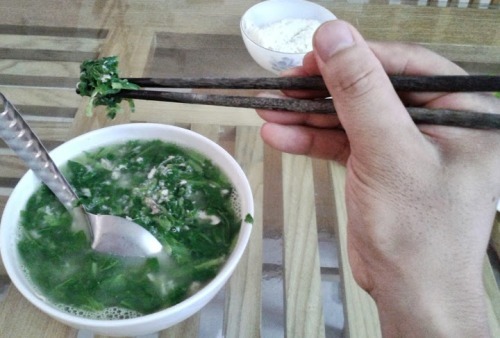 Don’t stand your chopsticks vertically in the bowl of food. People here only do that for a passed-away person in a funeral or in a ritual ceremony. This action may make locals frighten. Above I have instructed you how to eat with chopsticks. I hope you will get familiar and comfortable with this typical Asian dining utensil. You may also want to buy chopsticks to practice and to use in meals. Check out in Amazon. So do you know how to you chopsticks? Have you tried before? What was your feeling in the first time you tried? Share your experience and thoughts here. We’d love to hear from you!